This page is intended to be a showcase for those items that don't fit in the horse gear category. Basket stamped business card case with 2 interior pockets. Lined with smooth calf leather. Here is a Western looking tote bag. It is large enough to be a tote bag, but small enough to work as a large purse. It measures 14-1/2" wide and is 9" deep. The gusset is 6" wide and has a firm insert in the bottom also. 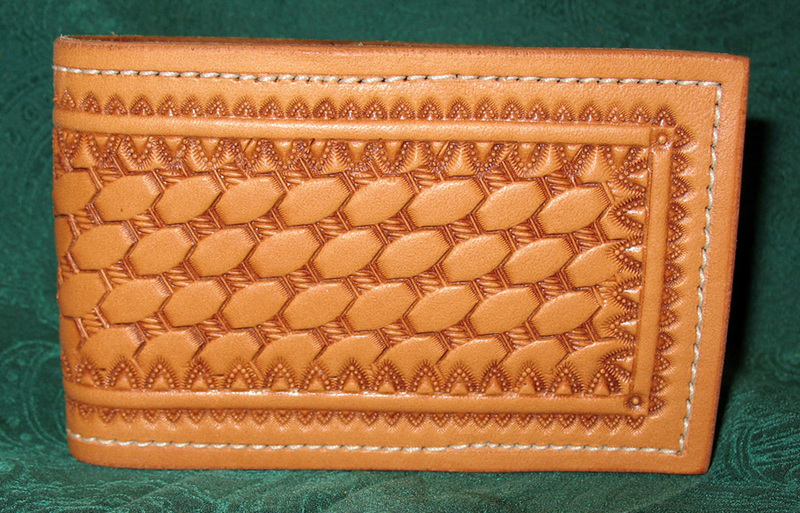 I made this one out of a firm tan chap leather and then did the gusset and overlay out of dark brown chap leather. 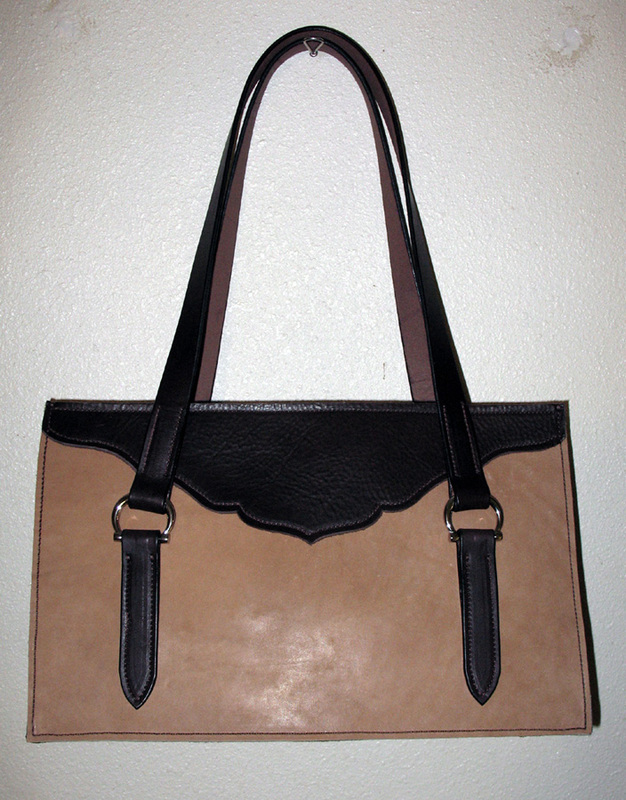 The handles are dark brown English bridle leather 24" long and allow for comfortable carrying over the shoulder. The hardware adds visual interest and lets the handles to fall easily out of your way as you reach in the bag. Shy made a few of these handy zipper pouches the other day. They are about 4" by 6" and are available in a variety of colors. She has more planned, so be sure to ask if there are any other colors. Some have a wrist strap and others do not, so be sure to ask. 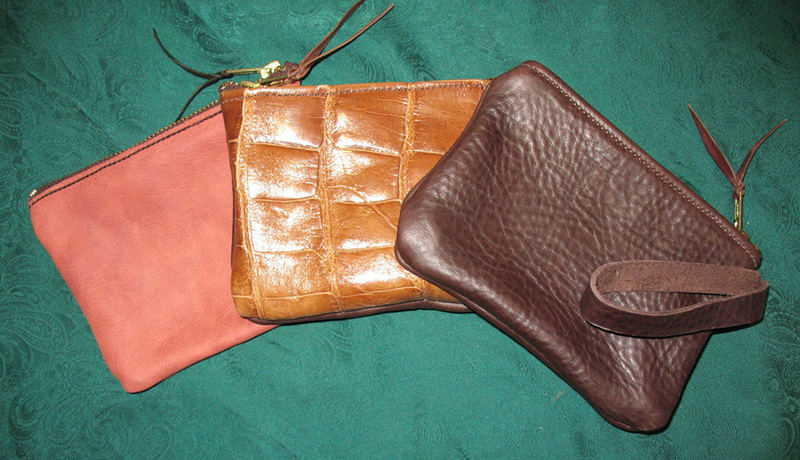 From left- dusty rose, peanut butter alligator (dark brown on the other side of this one) and dark brown with a wrist strap. We all know pocket can come in handy on a pair or chaps or chinks, so why not take that pocket with you? 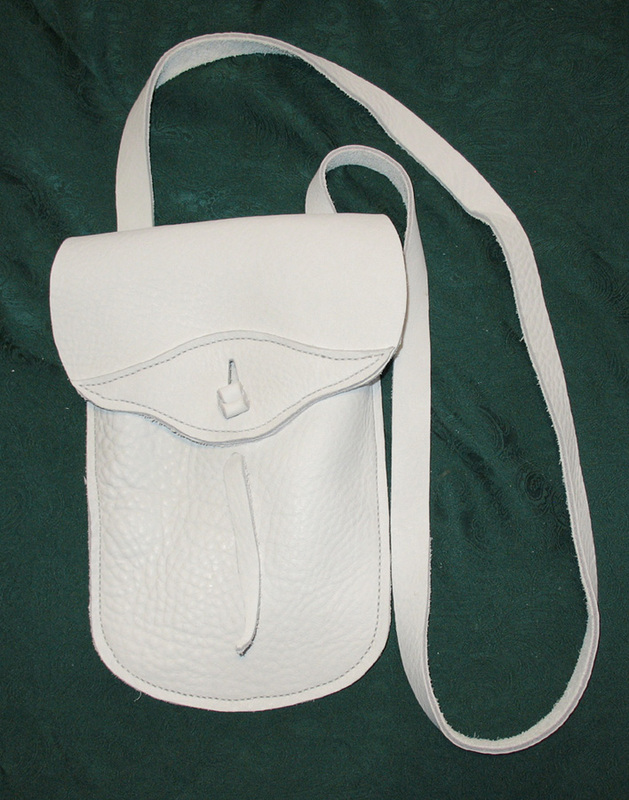 This soft chap leather purse was inspired by the aforementioned pocket. This one also features the traditional leather button closure. The long strap can be worn over the shoulder or across the body, whichever you prefer. Just what every chef needs! 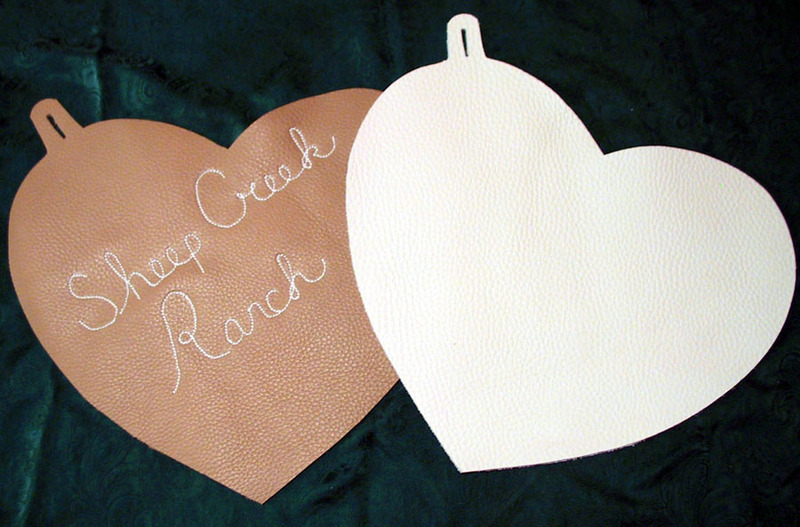 Who says leather belongs in the tack room? 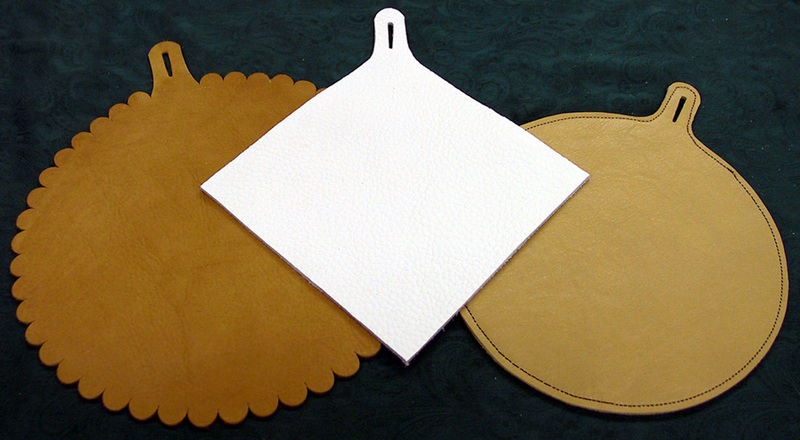 These leather potholders are both unusual and useful. They work better than any cloth one I have tried and I have yet to set one on fire. Can't say that for the quilted cloth one that was left on a frying pan lid and got burned to a crisp this spring. Made of chap leather, some are one thickness and others are two, depending on the thickness of the leather we used to make them. We offer these in three sizes and several styles. Regular- $10, Large- $11, Extra Large- $12. In the plain square style, Regular are 6" by 6", Large are 7" by 7", and Extra Large are 8" by 8". In the round, scalloped round and scalloped square styles, only Large and Extra Large are available. They measure approximately 7 1/4" and 8 3/4" across respectively. Note the new heart shaped potholders. We did these at the request of a client and liked them so much we decided to offer them here. Now if this wasn't fun I don't know what is. My daughter Maysa and I dressed up this palm leaf straw hat for her this summer. We used some punches to cut out the flowers, sewed the flower centers on by hand and then glued them to the brim. Maysa selected the colors of leather and helped with the flower placement as well. Here's the lucky girl modeling her new headgear. This is a project I've been meaning to do for a year or so, a purse for myself. The way it turned out, it is more of a briefcase than a purse, but I just love the roominess of it. It's 14" wide and 8-1/2" deep and has a 4-1/2" wide gusset, so it can hold a lot of "necessities." Because of the weight, I chose a short handle more like for a briefcase, but attached it to the gusset instead of the lid. Here's a good close up of the concho on the front flap. It's more than 3" in diameter and solid sterling. My sister, Vandy Douglas, made this and all of the other silver trim for me. Note the brightness of the art deco-inspired initials in contrast to the oxidized background. These are the small conchos at each end of the strap. Here is a nice shot of the three piece buckle set that completes the trim. That girl sure knows how to engrave, doesn't she? A good look at the serpentine border and the basket stamping on my purse. This was a very fun project to say the least. I made this purse for my friend and able assistant Shy for her birthday last summer. I had a pretty good idea what she wanted and this is how it turned out. It is medium brown English bridle leather. The lining and gusset is a dark brown chap leather. Although the strap isn't visible in this picture, there is a steer head concho at each end of the strap and a three piece steer head buckle set provides adjustment for the shoulder strap. She wanted the stamping to be simple, so I did two beaded borders with a serpentine stamp in between them. Here is the same purse six months and one concho later. We gave Shy this concho as a Christmas gift to match the two at each end of the strap at the buckle set on the strap as well. It really dresses it up I think. A 3" by 5" legal pad inspired this project. I found these little legal pads when shopping for office supplies and thought they would be just the right size to carry in my purse. Knowing that a cover for it was in order, I copied one my dad had made and given me for a larger notebook years before. This was the result. Here's the front of the notebook cover. Note the interesting basket stamp I used. The tool was made by Bob Beard and has a very tiny Sheridan style flower in the center. Here are a pair of checkbook covers I've been meaning to make for about ten years. Shy finally talked me into doing something for myself, so I decided to replace my plastic checkbook covers with something a little classier. The one on the left is for my personal account and is just two beaded borders with a diamond stamp and seeder centered between them. At right is the more elaborate business account checkbook. I used a braid center basket stamp for the body of the piece and did a San Carlos border framed by a beaded border around the outside. I wanted them to be very different so I could tell the two apart at a glance and think I achieved that goal. This is a checkbook cover I made for my husband at the same time I did mine. His features a double beaded border around the outside edge, San Carlos border and then a very small beaded border at the edge of the basket stamping. The basket stamp with the flower center was custom made by tool maker Bob Beard. When I teased my husband about wanting a flower center basket on this piece he told me it takes a real cowboy to pull it off. He's just the man to do it. This is the inside of Lee's wallet. He wanted his checkbook to be all-inclusive, with spaces for credit cards as well as his checks. Note the little leather flap on the left for putting between duplicate checks to prevent write-through. This was my solution to the credit card problem. I would rather have an extra case in my purse than try to write checks over the bulk of cards jammed in my wallet, so I made a separate case for them. The body of the case is an association basket stamp framed by beaded borders with a serpentine border in between them. Here's the inside of my card case. There are four card pockets on each side and then a pocket behind the card slots for cash or notes. Quite handy, if I must say so myself.